Another of Glasgow’s growing band of coffee shops, Spitfire Espresso joined the fray in 2015. Unlike the subject of Monday’s Coffee Spot, Meadow Road Coffee, which is taking speciality coffee out west, Spitfire Espresso is right in the centre, on the corner of Candleriggs and Ingram Street, less than 10 minutes’ walk from both Glasgow’s Queen Street and Central Stations. It’s also close to the likes of Laboratorio Espresso and Riverhill Coffee Bar and, in the other direction, McCune Smith. Spitfire also uses a local, Glaswegian roaster, in this case Avenue Coffee, which provides Spitfire with a bespoke espresso blend. Spitfire Espresso is a bright, spacious spot, with high ceilings and plenty of seating, including tables outside on both Candleriggs and Ingram Street. There are also generous windows on both sides, adding to the bright interior. There’s a strong World War II/swinging 50s theme, with a rock ‘n’ roll soundtrack. As well as the aforementioned espresso, there’s also an all-day eggs menu, plus sandwiches and cakes, with the egg dishes and sandwiches named after WWII aircraft (eg Hawker Hurricane, P51 Mustang and Lancaster Bomber, not to mentioned the eponymous Spitfire: scrambled, poached or fried eggs on toast). Spitfire Espresso occupies a lovely spot on the corner of Ingram Street and Candleriggs. Ironically, given that it’s under the offices of the Ordnance Survey, while I was trying to find it, Googlemaps had it halfway down the street (although this has since been corrected). 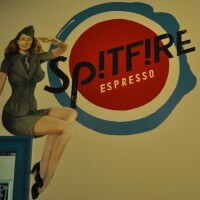 Spitfire Espresso, which opened in March 2015, is the creation of husband-and-wife team, Danny (a Kiwi) and Emily (a Scot), who have created something very special behind the iconic branding of Britain’s most famous fighter aircraft, which Danny’s great-grandfather flew in the Second World War. The basic shape of the shop is square, but with the corner cut off, which houses the recessed door. There are windows along both Candleriggs and Ingram Street, which, while not quite running from floor to ceiling, are nonetheless easily big enough to make it a very bright space. This, coupled with the very high ceilings, make it feel very spacious. The interior is painted in red, white and blue (the colours of the RAF), with the exception of the areas under the windows (which are bare brick) and the floor, which is beautifully tiled. The red, white and blue colour scheme matches the counter, furniture and cups, which reinforces the branding. The layout is simple. You enter in the corner, with the counter ahead of you in front of the right-hand wall. Behind this are a couple of openings which lead into the simple kitchen where all the food is prepared. The counter itself is painted red, matching the red of the two-group La Marzocco, which is on the left-hand end. The other end of the counter is given over to the considerable cake display, while the till is in the centre. The seating, meanwhile, occupies the bulk of the space, although the area in front of the counter is left open. A window-bar runs under the windows along the Candleriggs (left-hand) side, while a padded bench lines the back wall, with two four-person tables and a solitary two-person table. There are three more two-person and another four-person table in the middle, with a final pair of two-person tables, one at the counter’s far end, the other tucked away to the left of the door. Spitfire originally only had one grinder, for its bespoke blend from Avenue Coffee. However, a second grinder should have now been pressed into service, allowing Spitfire to offer decaf and guest espressos from various roasters on a rotating basis. I tried the Spitfire blend as a straight espresso, finding it to be excellent, smooth and well-rounded, with slight sour notes, but not unpleasantly so. However, despite my praise, Danny reckoned that the grind was a little off, meaning that it was running a little long. I do like a perfectionist! Spitfire offers an all-day eggs menu. I tried the eponymous Spitfire, deciding to have my eggs scrambled. Despite the fact that it was less than an hour to go to closing, Danny was more than happy to disappear into the kitchen and return a few minutes later with some perfectly-scrambled eggs, lying on a generous slice of awesome toast. Danny and Emily are a lovely couple and this shows in the atmosphere that they have created in Spitfire Espresso. The service is excellent and you couldn’t want for a more friendly welcome. December 2016: Spitfire Espresso was a runner-up for the 2016 Happiest Staff Award. March 2018: I’ve found Spitfire Espresso’s sister (in spirit) coffee shop, Spitfire Coffee, in New Orleans!